When you are working with tiny seed beads, the needle you choose to use will make a big difference in your beading satisfaction. Selecting the right size and type of beading needle will make your beadwork more enjoyable and will minimize problems with broken beads and ruined beadwork. You should avoid using regular sewing or embroidery needles to make beadwork. They may be convenient and inexpensive, but these types of needles are thicker with larger eyes than needles made specifically for beading. Japanese beading needles are thin flexible needles with a reinforced eye and a slightly rounded point. They are a lot like English needles, coming in a similar range of sizes, but they are more durable (and more expensive!). Although Japanese beading needles are thin and flexible and therefore perfect for loom and off-loom bead weaving, they do not get bent or break as often as English beading needles. They are made by Tulip or Miyuki. The slightly rounded point makes it less likely that you will pierce the thread when making multiple passes through a bead. English beading needles are long thin flexible needles that come in a range of sizes to fit even the tiniest of seed beads. These are the most commonly used type of beading needles. They are used for loom beadwork as well as off-loom beading stitches such as peyote, brick stitch, herringbone, netting, and others. English beading needles come in several different sizes. The most commonly used needle size is a size 10 or 12, both of which work well with size 11/0 beads. Selecting the correct needle size depends on three factors: the type and size beads you are using, the type and size thread and the number of passes you need to make through the beads. 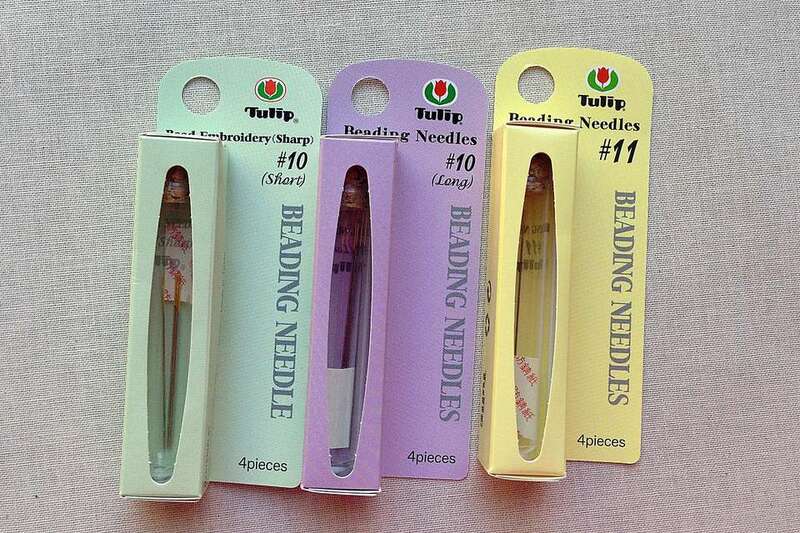 English beading needles can be purchased at craft stores, local bead stores or online bead suppliers. Brands to look for are Beadsmith English Beading Needles or John James English Beading Needles. Bigeye needles are needles that are super easy to thread. They have a giant eye down the entire length of the needle! Bigeye needles are thicker than English beading needles since they are made of two pieces of metal joined together at the top and bottom. When the needle is pushed from the ends, the center bows out to reveal the single large eye that runs the entire length. Available at most bead stores, big eye needles are best for stringing projects, working with elastic cord and other slightly thicker stringing materials. BeadSmith and Beadalon big eye needles are widely available. They are not well suited for stitches that require multiple passes through a bead. Twisted beading needles are made of flexible wire with a large loop eye. They are perfect for stringing pearls and gemstones on silk thread or ribbon cord. They do not work well for off-loom bead weaving since they are too flexible to follow a path through multiple beads. Milliners needles are similar to English beading needles except they are more widely available in sewing supply stores. Milliners needles are slightly thicker with a rounder eye than English beading needles. They are suitable for the same type of off-loom beadwork, loom beading and bead embroidery. Glovers needles are a special type of needle that is used for stitching seed beads to leather, suede or other thick fabrics. They are sharper than other beadwork needles and have a triangle shaped pointed tip that easily penetrate leather. Glovers needles come in a variety of sizes similar to English beading needles. Threading a beading needle can be tricky, particularly for a beginner. There are a few steps that you can follow to thread your beading needle. If you are working with a thread like Fireline, Wildfire or Nymo, flatten the thread ends before trying to thread the needle. Do this by running the end through my front teeth, but you can also use a jewelry making plier. Bring the needle to the thread end. This is the opposite of how we think about doing it - but it works better. Instead of pushing the thread through the needle, try bringing the eye of the needle to the thread. Remember to have patience when trying to thread your needle the first few times. Even seasoned beaders have trouble threading their needles from time to time.